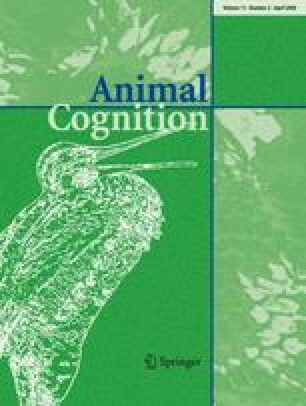 One of the fundamental issues in the study of animal cognition concerns categorization. Although domestic dogs (Canis familiaris) are on the brink to become one of the model animals in animal psychology, their categorization abilities are unknown. This is probably largely due to the absence of an adequate method for testing dogs’ ability to discriminate between large sets of pictures in the absence of human cueing. Here we present a computer-automated touch-screen testing procedure, which enabled us to test visual discrimination in dogs while social cueing was ruled out. Using a simultaneous discrimination procedure, we first trained dogs (N = 4) to differentiate between a set of dog pictures (N = 40) and an equally large set of landscape pictures. All subjects learned to discriminate between the two sets and showed successful transfer to novel pictures. Interestingly, presentation of pictures providing contradictive information (novel dog pictures mounted on familiar landscape pictures) did not disrupt performance, which suggests that the dogs made use of a category-based response rule with classification being coupled to category-relevant features (of the dog) rather than to item-specific features (of the background). We conclude that dogs are able to classify photographs of natural stimuli by means of a perceptual response rule using a newly established touch-screen procedure. The online version of this article (doi: 10.1007/s10071-007-0123-2) contains supplementary material, which is available to authorized users. This work has received research funding from the European Community’s Sixth Framework Programme under contract number: NEST 012929. We thank especially Karin Bayer and Zsófia Virányi for helping with the experiments, the dog owners for participating and three anonymous reviewers for comments. The experiments comply with the current laws of the country in which they were performed.